Here are some of the latest and greatest photos of our house progress. Slowly but surely we're putting our touch on everything. Here is a link to the tour from about three weeks ago, if you'd like to see more. In the living room, we have a new area rug that was a steal and a half that I'm obsessed with. Another great find is the chunky turned leg end tables. We have one that we took home from the showroom and have the other one on order... I hate having to wait for furniture. As you know from my post about the living room design inspiration, we are also waiting on two grey wingback chairs and a linen tufted ottoman. 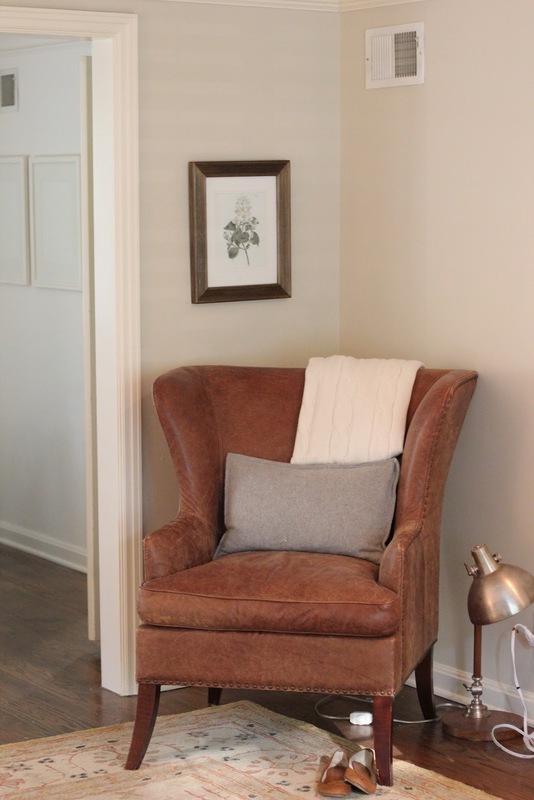 I'm really liking how this nook in the living room is coming together - cable knit throw, cashmere grey pillow, and cozy leather chair... now I need a table of sorts and maybe a little needlepoint top foot stool? I also want to order new legs for the chair... something less shiny. Some frames going up in the dining room. We're in the process of doing a little DIY kitchen update. We plan to do an addition in the next year or two, adding a big brand new kitchen and hearth room. So, in the meantime, we're doing a DIY, budget creative update on the current kitchen. So far we've removed the upper cabinets and stone tile on the main wall and replaced it with wooden paneling. We plan to cover the countertops (in fact I'm working on it today!) with white subway tile and add open shelving and a range hood. I'm debating on whether or not to go ahead and order the new range that we'll use in the big, brand new kitchen... or if I can live with this one for the moment. 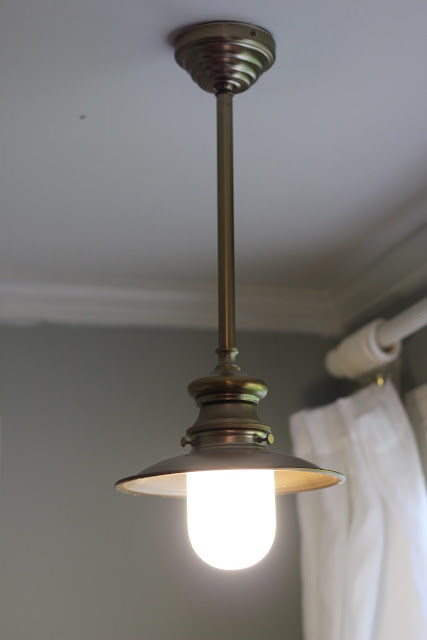 We've also replaced the light fixtures with these antique brushed brass pendents from Home Depot. Another steal at just $54! I LOVE them. We have one over the sink, and one over the kitchen table. 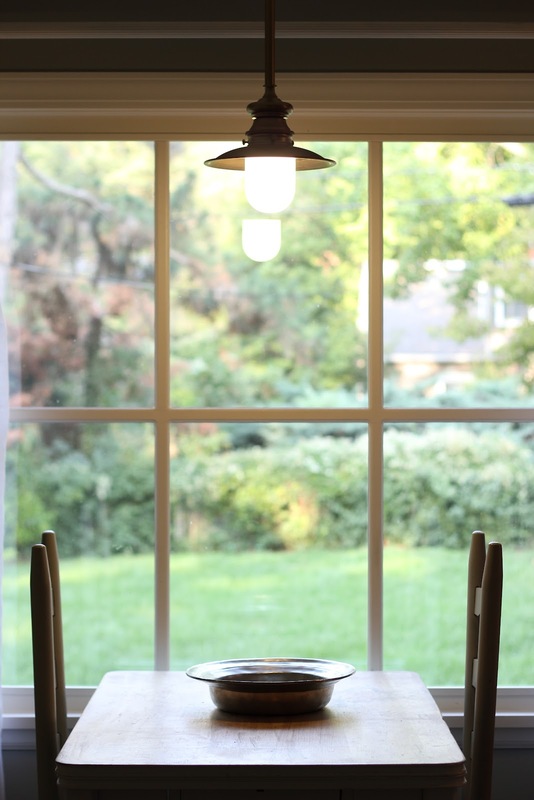 This is the little table in the kitchen - it has a great feel and really good light for my food photography. I am starting to warm up to the cozy (small) little kitchen. Continuing the antique brass theme (that matches the house's original brass and glass door knobs), we've hung drapes in our bedroom. And working on hanging artwork... don't you like the frames?! I did a DIY finish on them with gold paint and wood stain. A comeplete post about my method is coming later this week. Emma's room is coming together - polka-dot drapes, her lamb mobile and vintage prints are hanging. You have done a great job! Love all of the changes and look forward to seeing even more updates. P.S. I love the table in the kitchen-it's very cozy and what a great place to eat, read and work from! It all looks gorgeous! You have achieved the sense of homeliness in a few weeks, that I'm still trying to create in my 'new' house after 2 years - lol! The brushed brass pendants are particularly fabulous - where are they from if you don't mind me asking? It looks incredible! When we moved, Ella's room was the first room that was complete. I love your taste. It's going to look great with your touches! It looks lovely, Jenny! Can't wait to see the DIY method for the frames, because that is exactly the look I'm going for with our frames! Hi Jenny, just had to come over and see what you have been doing in your designs...Love the kitchen table, and all the tone on tone beauty. Looking great! The chair legs have a lot of flair. 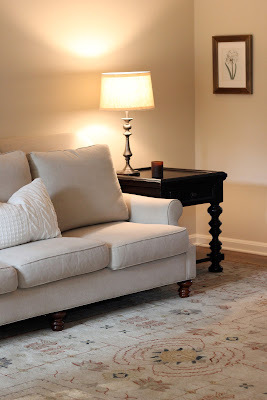 Use Annie Sloan Chalk Paint to get the color you want. Amazing product. So happy! We're in the process of moving and I can't wait to start refinishing furniture and hanging artwork. You're making me giddy! I adore you new home!! I adore that leather chair, where did you find it? Good luck can't wait to see more!! It's all looking fabulous Jenny, I love it! Its so pretty what a great start. Where did you find those fantastic napkins, "try it you might like it"? You have a good taste of choosing frames and designs.As well as the color combination of every details. Love the fabric for emma's drapes. Would you mind sharing where you found?